Hi Folks, hope you’ve all been enjoying the Christmas festivities. Before continuing, can I please just mention that when I posted in September about my first salve treatment I was inundated with literally hundreds of questions and requests for advice. I apologise for being late in replying to some of the messages, or some that I may have missed altogether. At the time I was totally overwhelmed by the response. If, further to reading this post, you are seeking an urgent response please mark your query as ‘Urgent’ and I will endeavour to reply asap. I do however need to state that I am not in a position to give medical advice, but am happy to share my story with you, in the hope that it will raise awareness about natural cancer therapies, and that it may help you or someone you know who may have been affected by cancer. If you are contemplating using black salve, or other natural treatments, I would suggest that it should be done under the guidance of a qualified, experienced medical herbalist/naturopath. If you plan to buy black salve on the internet or otherwise, I would suggest that you are confident that it is from a reputable source. It is likely that additional products may also be required, such as drawing ointment, yellow salve, poultice powder, healing ointment, anti-scar cream. I would also suggest that black salve is not considered a treatment to be used in its own right, that would be the equivalent of having just the surgery but no chemotherapy/radiotherapy. Salving is merely a way of removing the tumour(s). It is still imperative that the whole health is addressed- both the internal body health and the psychological and spiritual health. As part of my own healing journey I have been doing lots of natural therapies (as mentioned in an earlier post), and will continue to do so, in fact much of the protocol is now just an everyday part of life. Black salve has been around for literally thousands of years. If you want to read further on the subject I would recommend a book called CANCER SALVES, A BOTANICAL APPROACH by Ingrid Naiman. Ingrid Naiman has extensively researched salves for many many years, her comprehensive book is the definitive guide to the use of cancer salves. She also has a very informative website, see ‘Sacred Medicine Sanctuary’. Black salve is applied to the area overlying the tumour. Whilst most people were busy during December planning for all the Christmas festivities, I have been busy otherwise – removing several breast tumours. 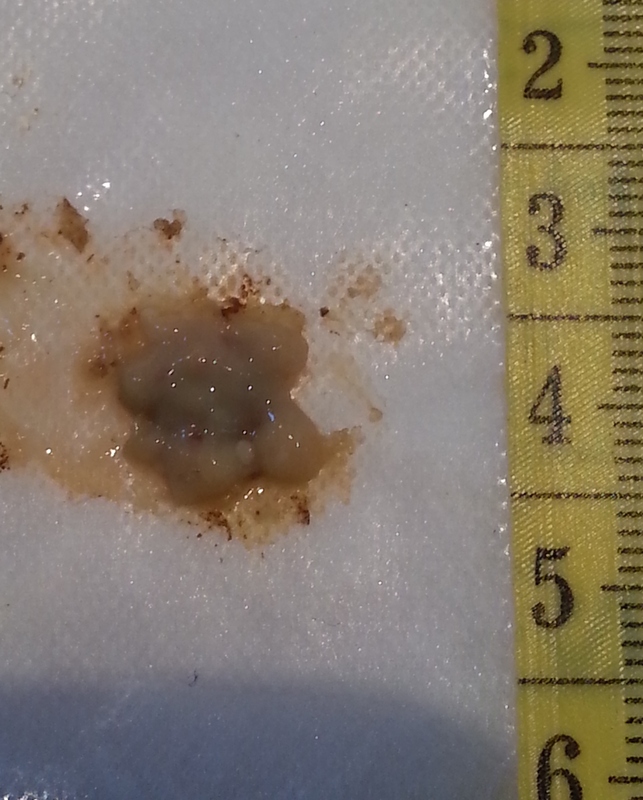 Some of you may recall that my first black salve treatment was earlier this year, in August/September, where I removed a large breast tumour measuring 4cm x 3cm x1cm. 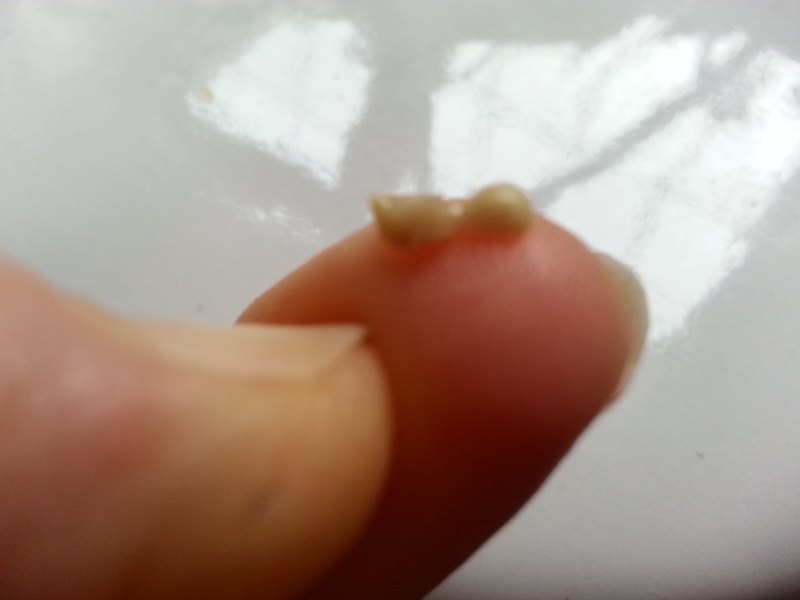 This came out in 2 bits – the 1st bit after 21 days and the remaining larger part after 28 days. I took the large tumour to the hospital in a jar of vodka for histological examination, and I am happy to say that I have received histological confirmation that it was cancerous breast tissue – not that I didn’t think for one minute that it wasn’t, but I felt that it was important to have the confirmation on my medical records. This was part 1 that came out after 21 days. 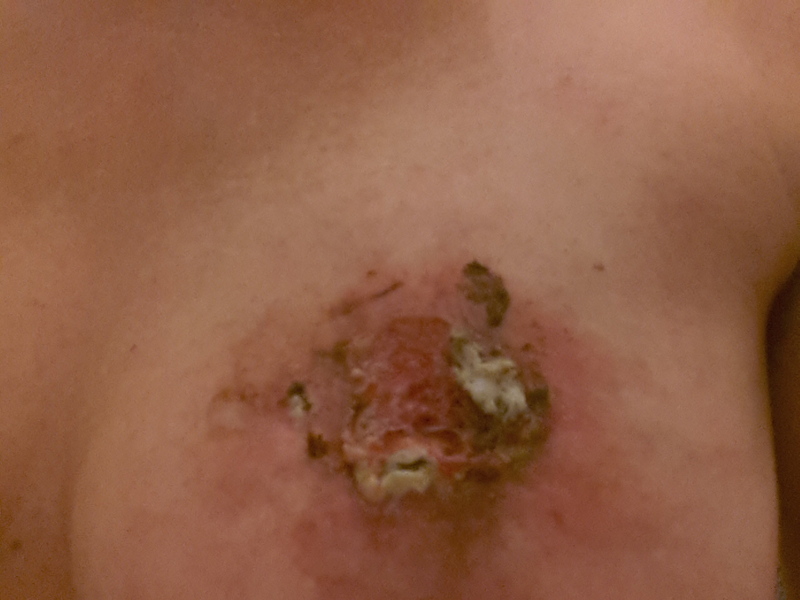 Some tumour was still remaining at the lower edge and at the side so I applied another salve application. 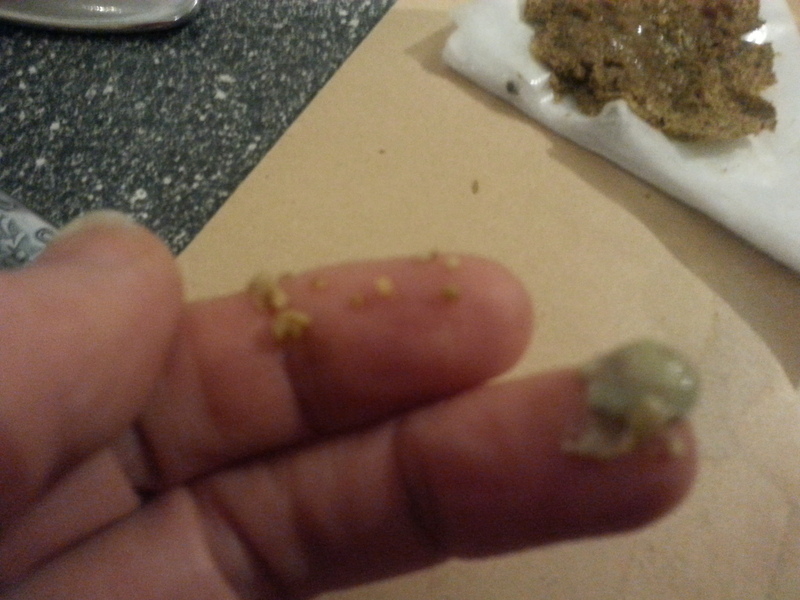 The cream bit that resembles a piece of chewing gum is the tumour, the dark bit surrounding it is the black salve, and the brown stuff surrounding that is the poultice that I applied to help release the eschar. The wound has healed up beautifully, leaving just a small scar, with character might I add 🙂 The photo below was taken 8 weeks after the tumour was removed. 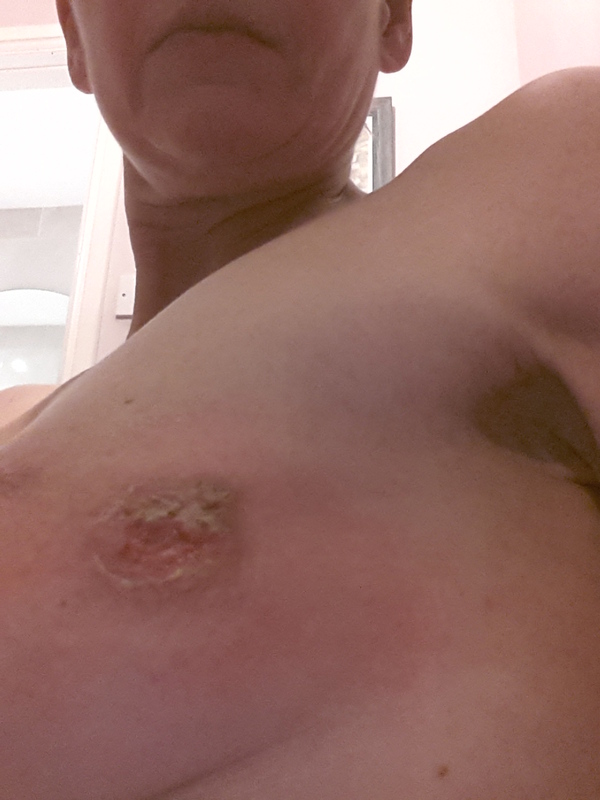 I wanted to give myself a little time to get over the first salve treatment before starting on the second tumour. But then I received some not so good news in November, i.e. 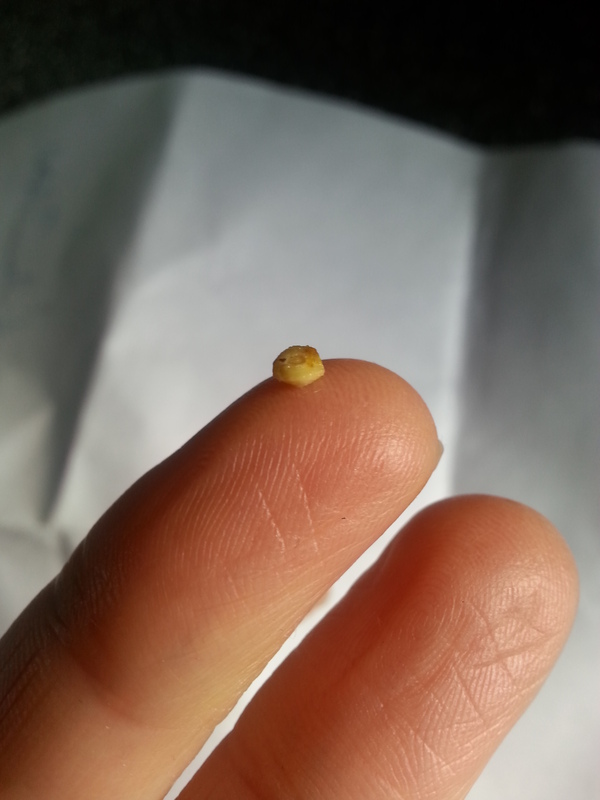 that the small tumour had grown from 0.9cm to1.4cm, and that there was also a tumour visible on the medial side of the breast measuring 0.9mm ( I was aware of a small lump in this area but I had been told previously by the surgeon that it was nothing to worry about, however on the most recent scan I was told it was likely to be cancerous). Anyhow, bearing in mind this news, rather than delay matters, I decided to get started with salving on the remaining two tumours. 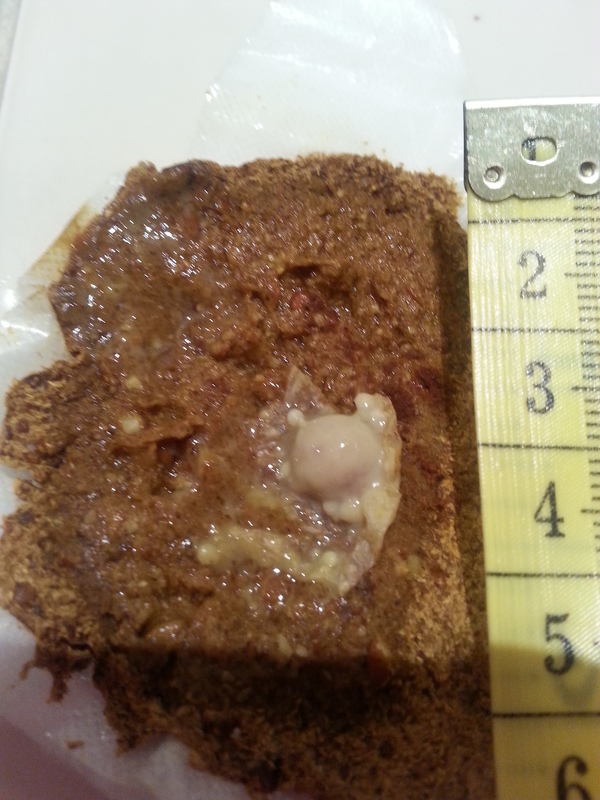 I began the 2nd salve treatment on the lateral side of my left breast on Friday 28th Nov and on Saturday 6th December out popped an irregular shaped tumour measuring approximately 1.4cm.This has been sent to pathology and I am currently awaiting the report. First photo was taken just after tumour came away. Photo below was taken 2 weeks after tumour removal. So to finish I’d like to wish you all the best for 2015, with lots of Love, Peace, Happiness, and Health!